I can’t help but smile as we ride onto the Steam Packet ferry ready for the short hop from Liverpool to the Isle of Man. 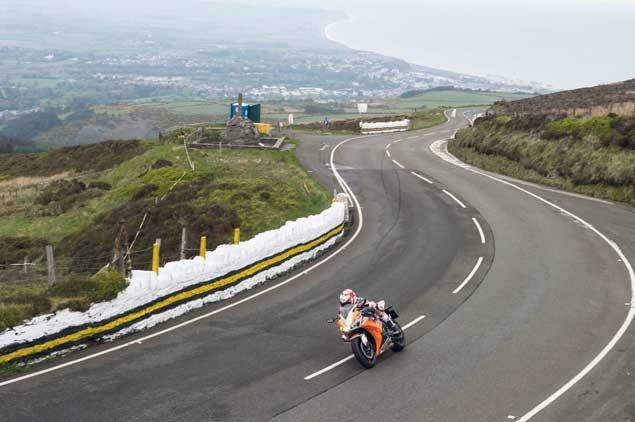 o matter how many times I’ve raced at the TT or visited the island I still feel a buzz as Douglas prom comes into view. This time it’s a little different because I won’t be racing. It’s a couple of weeks before TT race week, but Bruce Dunn and I are lucky enough to have two cracking road bikes to play with for a few days. 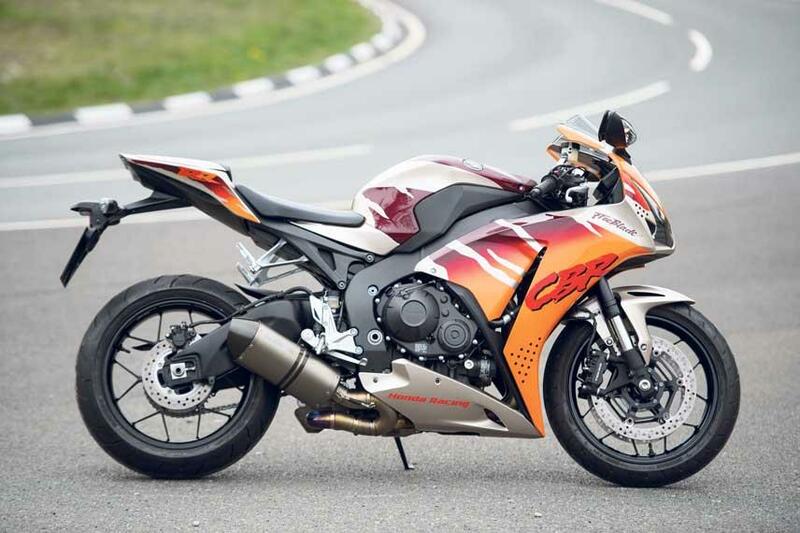 Honda’s Fireblade and the Suzuki GSX-R1000 may not have the gadgetry or peak power figures of the latest 1000cc machines, but they are outstanding bikes. 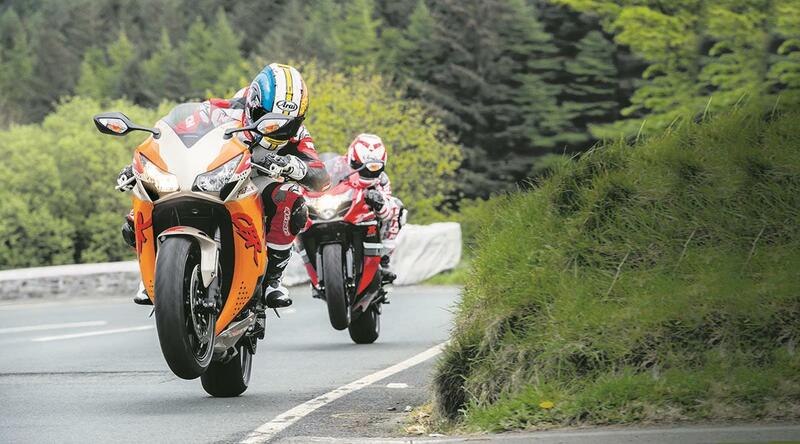 The Blade still holds the lap record at the TT and, from my experiences in Superstock practice last year, is simply a lovely bike to ride at speed. It’s the same on the road. Words like ‘nice’, ‘easy’ and ‘forgiving’ apply perfectly – it’s a rolling argument for why you don’t need rider aids at all. Today it feels great to get back on its familiar seat. The view is classic Honda, while the switchgear now feels a little dated. I’m undecided about the reproduction of the Urban Tiger looks (some onlookers called it ‘brown’). But there’s something refreshing about getting on a litre sportsbike and riding it without spending an hour beforehand reading the manual or trying to work out what all the settings do. Twist the throttle: go fast, twist it more aggressively: go even faster. Simple. The inline four-cylinder motor is smooth and linear, with laser precision fuelling. There’s a sweet connection between the throttle grip and engine, which gives the rear tyre an easy time. It feels like you can dial in every last one of its quoted 178bhp. This not only makes sense when you are pushing the limits of mechanical grip, adding the power progressively on the edge of adhesion, but also makes the Blade a doddle to ride at slow speeds. This Urban Tiger is a pussycat around town. The GSX-R1000 is similar. Although not as precise on the fuelling, it’s still close to perfection. Power characteristics are like the Blade’s, with all the meat in the accessible mid-range, not at the top end. Sure enough, if you want to have fun, tuck in behind the accommodating fairing and generous screen and it’ll give any bike a run for its money over the unrestricted Mountain section on the TT course. 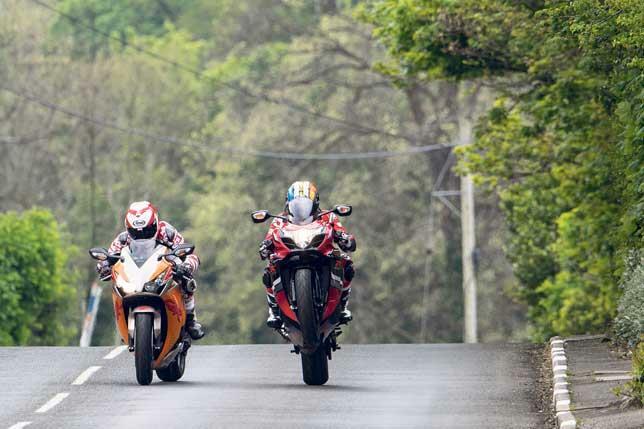 Both bikes lack the top end rush you’ll find on a new Kawasaki ZX-10R or BMW S1000RR – they don’t rev as quickly or attack their redlines with quite the same gusto – but with speeds approaching 160mph and more, neither bike felt wanting. 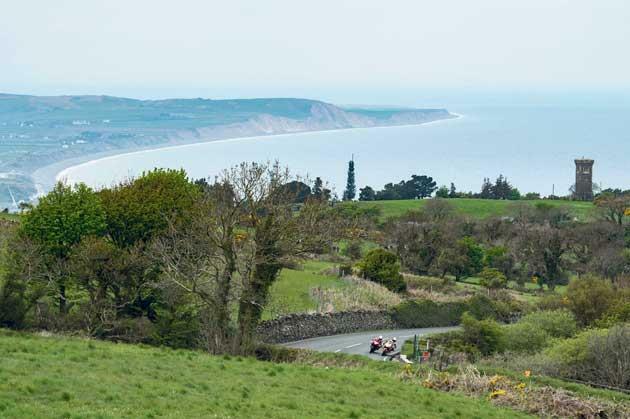 On a racetrack, pushing for lap times, I can see the advantages of the more powerful and electronically managed 1000c bikes currently dominating the market, but I never wanted any more on the climb out of Ramsey. 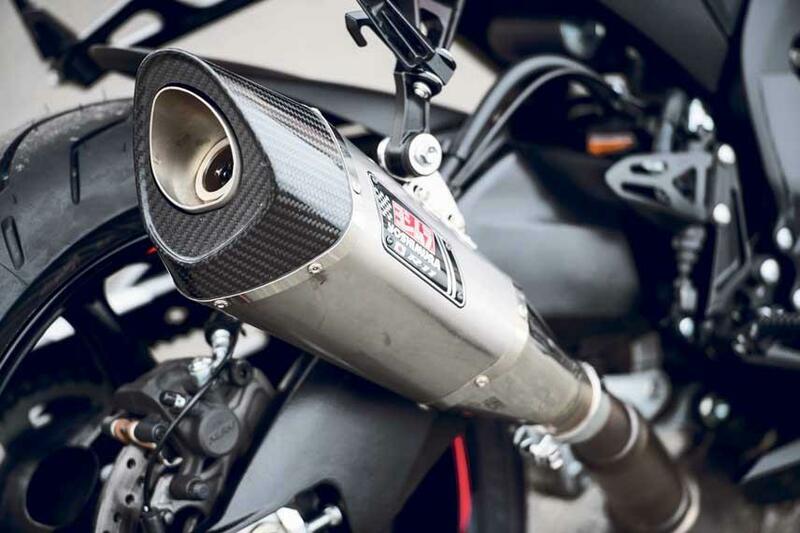 Exploiting the midrange, hearing the GSX-R1000 snarl through its massive air-box, controlling the wheelies with the throttle… Despite its age I still love the Suzuki motor. There’s no arguing both bikes feel a little dated when you throw in the endless turns of the demanding TT course, but they’re not bad, far from it. On the speed restricted sections from Cronk y Voddy to Kirk Michael, both bikes had a lovely flow to them. On this relatively busy road we didn’t want to scare the locals and kept our speeds legal, enjoying the natural handling of both bikes. The GSX-R feels a little heavier, it’s not as eager to turn, but once cranked over there’s a wonderful, positive feel to it: you feel part of the bike, wrapping yourself around the tank, hanging-off with ease until your kneeslider skims Manx tarmac. Both bikes also boast unflappable stability, useful when you’re heading towards the fastest single carriageway road in Europe. There’s no better feeling on a road bike than negotiating Ramsey hairpin, knowing you’re about to have a clear unrestricted run over The Mountain. 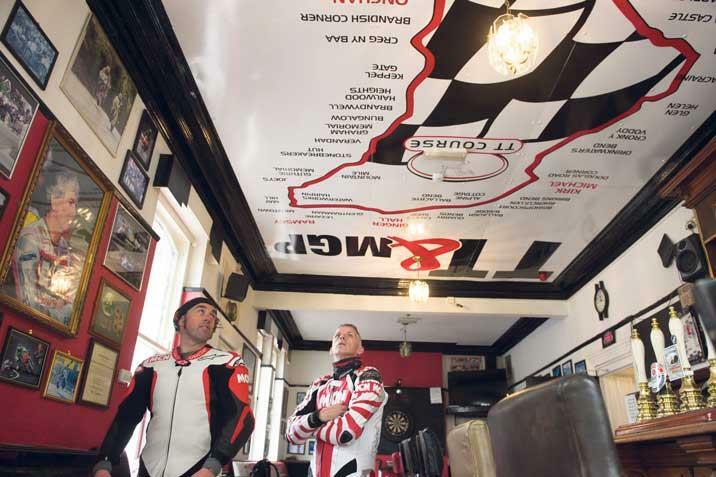 Warm the tyres through Waterworks One and Two, get used to the handling through Tower Bends, introduce your sliders to the Mountain section for the first time whilst getting the pads up to temp, braking aggressively for the Gooseneck; then let them have it. Hit the redline in the first three gears out of the Gooseneck ready to take the next two lefts in fourth, which are normally taken flat in fifth in the race. Obviously we’re not at race pace with two-way traffic, but already we can feel the difference between the two bikes. 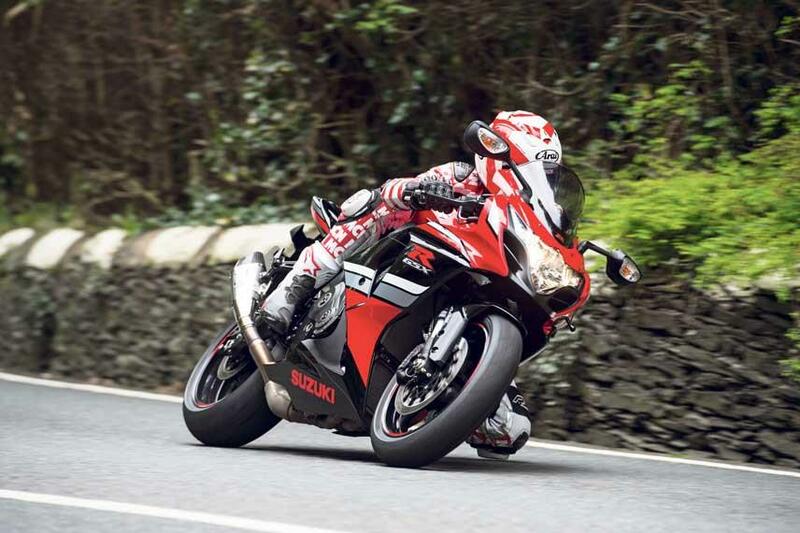 The Honda wants to lift its head more than the GSX-R, and with no anti-wheelie electronics to kill the fun I just roll the throttle or add a dab of rear brake. Up to Guthrie’s, out of Joey’s, still using the layby on the left for extra run-off and it’s all about the power uphill on the exit. The Honda has lovely mechanical grip; it feels like you can use every last mm of the road and grip, running it to the white line on the exit with confidence. It transmits what the rear tyre is doing as clearly as any other superike despite – or perhaps because of – its lack of rider aids. The GSX-R is impressive, too. It encourages you to pile on the coals early, there’s simply no need for any clever traction control intervention. Into Guthrie’s, take the first section as fast as you dare, then over the rumble strips, before jumping on the brakes into the second-gear uphill right-hander. The Suzuki’s ABS Brembo brakes are a little intrusive here, and despite the Brembo branding they don’t feel as strong as the Honda’s stoppers. The Blade is a clear winner on the brakes, but with more weight over the front it does have a tendency to lose rear grip when provoked, which is fun for experienced riders but a bit more alarming if you’re not used to it. As we continued to have fun over the Mountain the differences between the two bikes became more apparent. The Honda is a little easier into the turns, especially into the fast corners, the front-end gives a little more feedback and confidence flows as a result. The Blade also gives a huge amount of feedback on the exit and while the Suzuki always kept the Honda in sight, you do have to work a little bit harder. 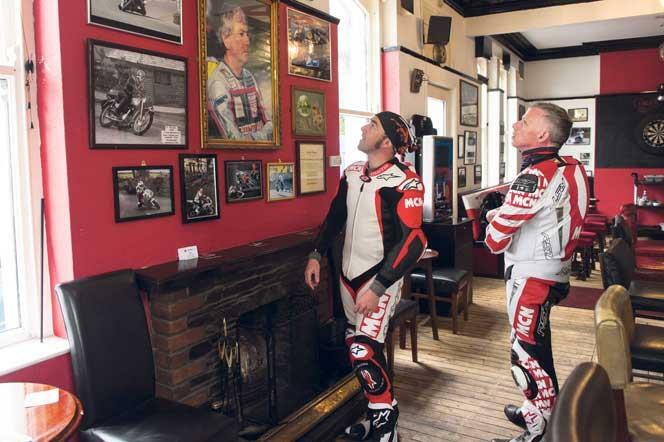 Sitting outside the Creg-ny-Baa pub in the early evening sun, Bruce and I couldn’t stop smiling as we admired the bikes as they crackled on the cooldown after another blast. 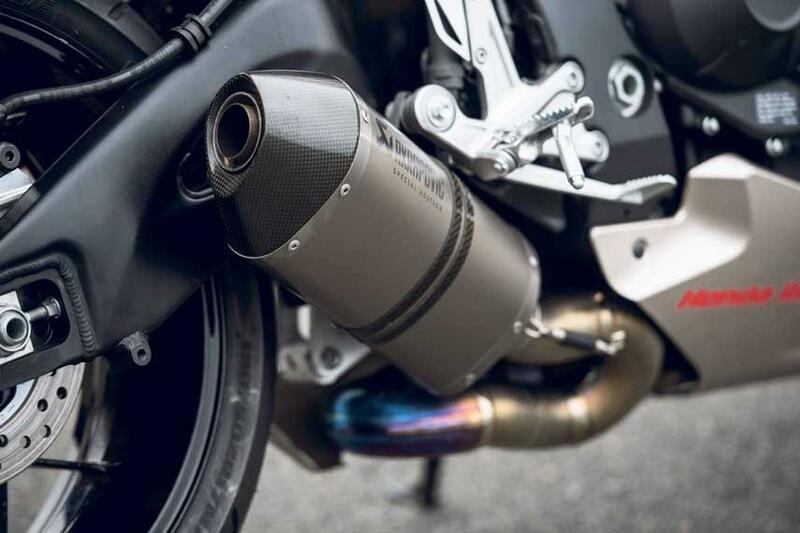 Arguably they’re not as desirable as the latest superbikes, but despite the Honda being brown we still like it, even more so with that sculpted Akrapovic pipe. 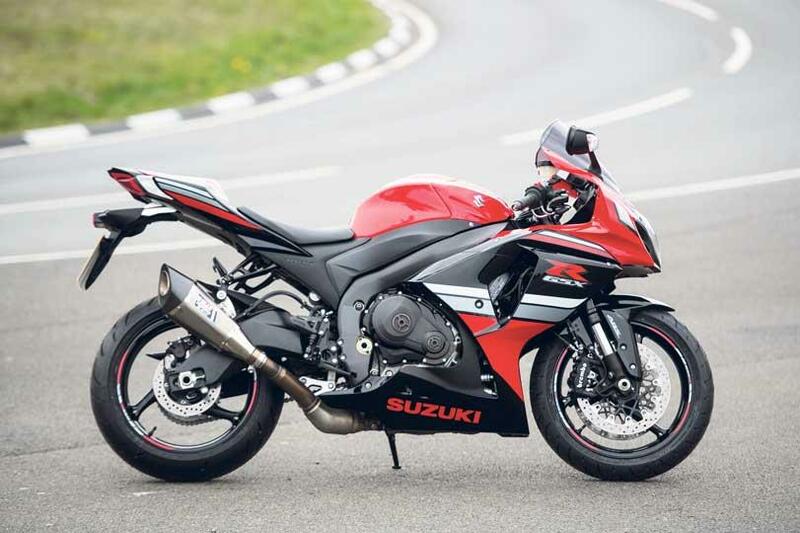 Suzukis should never be red but the GSX-R is instantly recognisable, is still desirable in its MotoGP colours, which includes the Yoshi pipe and costs £11,399 with ABS (£10,999 without). Furthermore we knew we had a long ride home the next day, but that didn’t faze us. Considering both bikes’ sporty potential, they’re reasonably comfortable for long journeys. I rode a GSX-R1000 to the south of France and back two-up just a few years back without too many complaints. They’re not one-trick ponies. But the main reason we were smiling so much was due to the sheer fun and character of both machines. It’s almost rude to call them ‘old school’ but in many ways they are, and that’s what makes them such a blast. You control the power, wheelies and slides, not a characterless ECU under the seat. Sometimes you want to read a book, not an iPad; sometimes you just want to get on a sportsbike and challenge yourself and not ride a computer. Don’t get me wrong, electronics have made sportsbikes safer and easier to ride, but I prefer to swim in the sea rather than a temperature controlled pool.